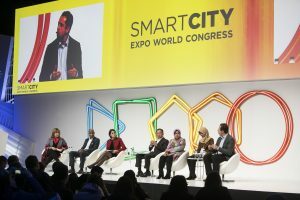 Tri Rismabarini, the first female mayor in Surabaya, the second largest city in Indonesia, with other speakers at the Smart City Expo World Congress 2017 in Barcelona. Source: SCEWC. A couple of weeks ago, the 2017 edition of the Smart City Expo World Congress took place in Barcelona. 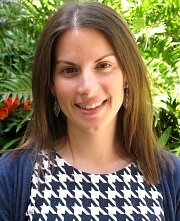 During the different conferences at the Congress and side events – including the 3rd International Conference of the Specialist Center on PPPs in Smart and Sustainable Cities (PPP for cities) led by IESE -, it was highlighted the need for more gender diversity in decision-making, leadership and management in cities and urban issues. Although significant improvements have been made towards gender equality globally, in terms of female’s participation in local decision-making and local government, women are still under-represented. In 2015, leaders around the world adopted the 2030 Agenda for Sustainable Development and its 17 Sustainable Development Goals (SDGs). The Goals and targets aim at stimulating action in key challenges for humanity and the planet in the next 15 years. Achieving gender equality and women’s empowerment is a stand-alone goal, Goal 5, and critical to achieve the rest of the SDGs. More precisely, Target 5.5 of the SDGs aims at “ensuring women’s full and effective participation and equal opportunities for leadership at all levels of decision-making in political, economic and public life”. In the past two decades significant progress has been made, but still only 23 percent of women globally had seats in parliament in 2017, and just above 30 percent of women had managerial positions worldwide in 2015. At a lower level, if we look at the ratio of female workers in the public administration, one of the indicators used in our Cities in Motion Index, we can see that on average, higher progress towards gender equality has been achieved. However, we still find big differences between countries. According to statistics by the ILO, as of 2015, in countries like Latvia, Finland, Lithuania, Estonia, Brazil, Sweden, New Zealand, Norway and Portugal, between 70-75 percent of workers in public administration were women. On the other hand, this ratio was only around 30 percent of women working in public administration in countries such as Egypt, Iran and Saudi Arabia. Recently, a new wave of women leaders is emerging at local level. 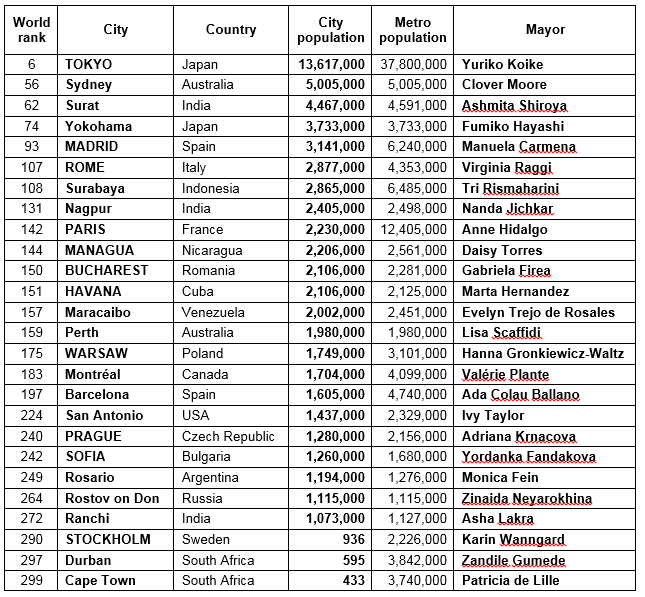 Cities like Paris, Tokyo, Washington, Rome, Madrid, Sydney, Surabaya, Cape Town, Bucharest, Barcelona, or more recently Montreal, have elected female mayors in the past few years – most of them for the first time. Today, we have more females running for office and being elected as mayors that ever before. Yet, the proportion of women mayors is still a minority. Although the global share of women elected to local government is currently unknown, with no official statistics of how many female mayors are currently in office, we can find some studies that have analyzed this issue. In 2015, UCLG estimated that fewer than five percent of the world’s mayors were women and just 20 percent of local councilors worldwide were females. Additionally, the City Mayors Foundation, an international think tank dedicated to urban affairs, found out that, as of July 2017, only 26 cities of the 300 largest metropolises were governed by women, which is equivalent to around 8.6 percent. (See Table 1.) As a result, we could say that just around 5-10 percent of world’s cities have women as mayors. Therefore, although the number is rising with recent elections, the proportion of women mayors is still very low. Diversity of all forms in political representation is key to ensure equitable and inclusive cities and communities. Gender equality is one of them. Women’s leadership and participation at every level of decision-making is crucial to achieve equality and inclusiveness. Therefore, closing the gender gap in political participation at local level and defining and implementing urban policies with a gender view should be a priority for cities around the world. Are our cities ready to lead gender-sensitive cities and promote gender equality at all levels? La igualdad de géneros a mejorado notablemente, permitiendo a las mujeres a ser participes en los diferentes campos sociales y politicos. In my country, there is also gender discrimination in Iran, which I think this discrimination has created a problem for the people. Sexual orientation imbalances have likewise accumulated ladies at the base of the worldwide esteem chain — in the most minimal paid occupations, in piece-rate, subcontracted work, and uncertain types of independent work, with practically zero access to fair work and social assurance. 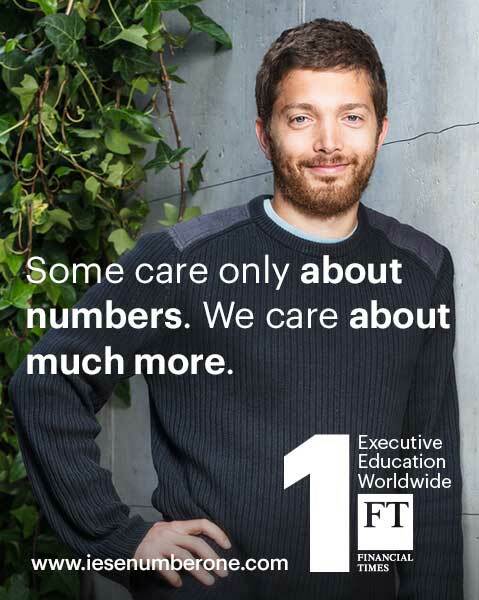 Ladies are a large portion of the world’s potential and releasing it expects access to not too bad, great quality paid work and additionally sexual orientation touchy strategies and controls, for example, sufficient parental leave and adaptable hours. All the worlds are going ahead but Africa doesn’t. African Female should be go ahead with others. It’s nice to see big changes allover the world. As an Indian feeling proud to see Nanda Jichkar name in the list. We can see a bigger change now clearly. Here in my own city Amritsar (Punjab), we have 15 female representatives in the local government. It feels great to see that people have started taking gender equality in a positive manner in the diversified areas. Thanks for sharing this great information. No doubt there has been a greater participation of women in every corner of the world and has been emerged as tool for eliminating gender gap. The list of female mayors not only indicates growing trend of women’s participation at every level but also shows that an eradication era of gender inequality has started at greater pace and will speed up in days ahead. Thanks for this valuable information. Very informative blog. No doubt, we can see a bigger change now clearly. It feels great to see that people have started taking gender equality in a positive manner in the diversified areas.